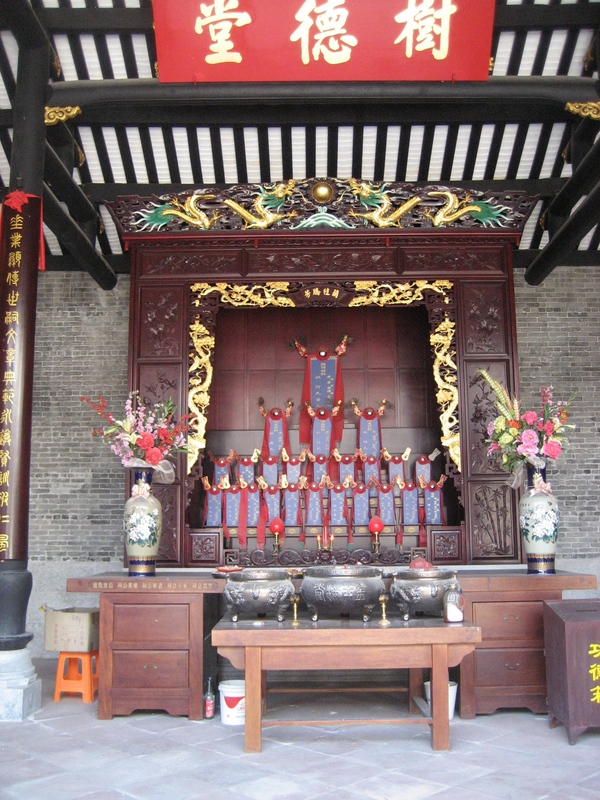 This morning I visited Chaolian (潮连), an island in the West River (西江) in the north-east of Jiangmen, to have a look at the many ancestral halls that can be found there. Selia Tan was my wonderfully knowledgeable guide and companion. 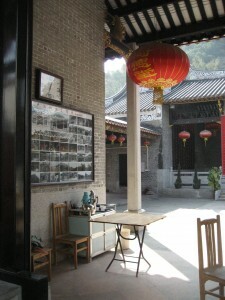 Once there were over 100 ancestral halls on Chaolian, but now about 50 remain. 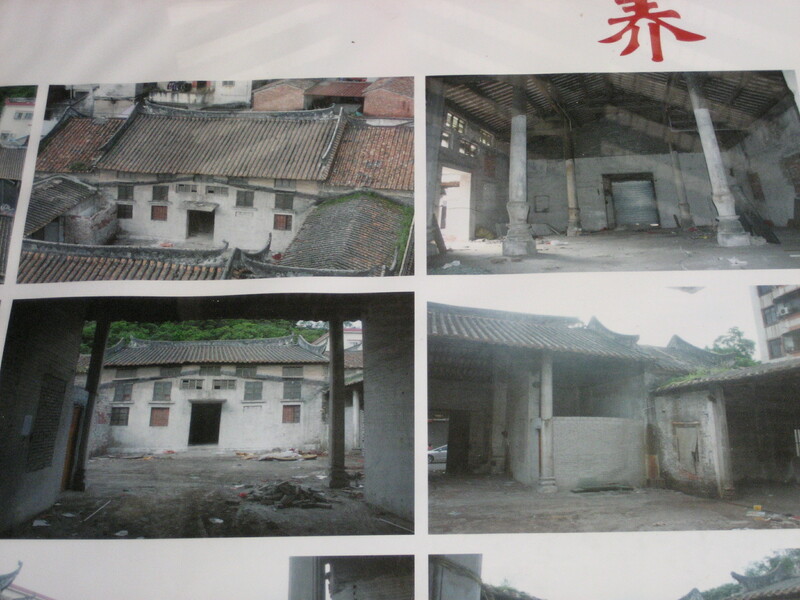 The oldest date from the Ming Dynasty, while the newest is still under construction. Although they are situated in the middle of a big city, the villages where the halls are located have been protected from large development because they are on an island and it has only been in more recent times that a bridge has been built. Beginning in Jiaxing Road (嘉兴路) in Tanbian village (坦边村), we first visited the Fang Yue Ancestral Hall Recreation Centre (方岳家庙康乐中心). 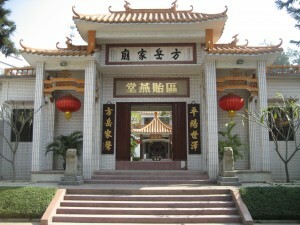 The hall is for members of the Ou (區) clan. 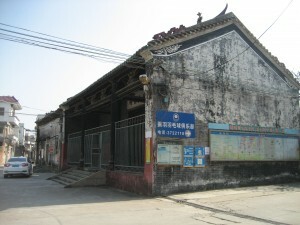 The original ancestral hall on this site dated from the Ming Dynasty, but was completely destroyed during the Cultural Revolution. 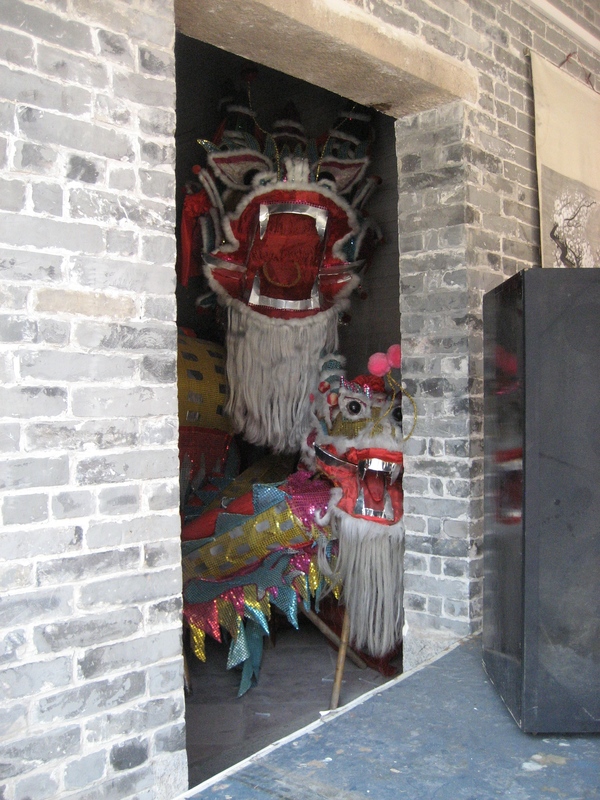 There are only a few stone artefacts from the original building remaining, including the stone lions that sit at the halls entrance. 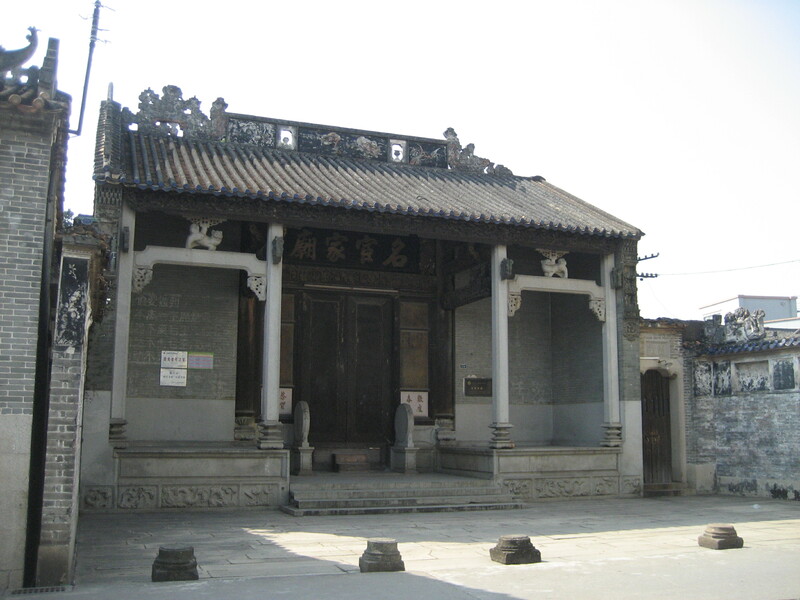 Fang Yue Ancestral Hall was one of the earliest ancestral halls to be rebuilt on the island, with construction taking place in the early 1980s. Because the villagers were still wary of the possible political implications of rebuilding their ancestral hall, the new hall’s design is not very traditional and they decided to call it a ‘recreation centre’. 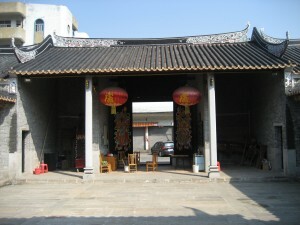 From there we walked along Lu Bian Hai Tian Street (盧邊海田街), past ancestral hall after ancestral hall. 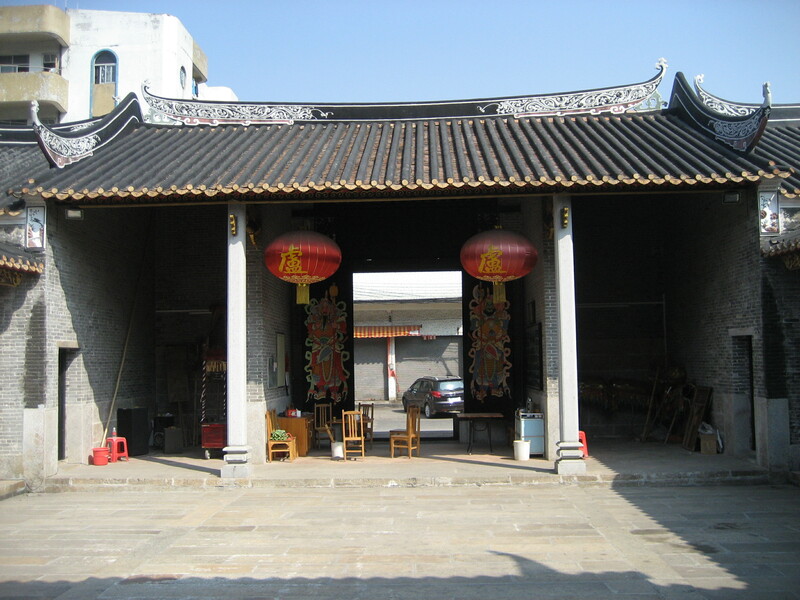 I hadn’t quite believed Selia when she said there were so many, because most villages I have been to only have one ancestral hall. 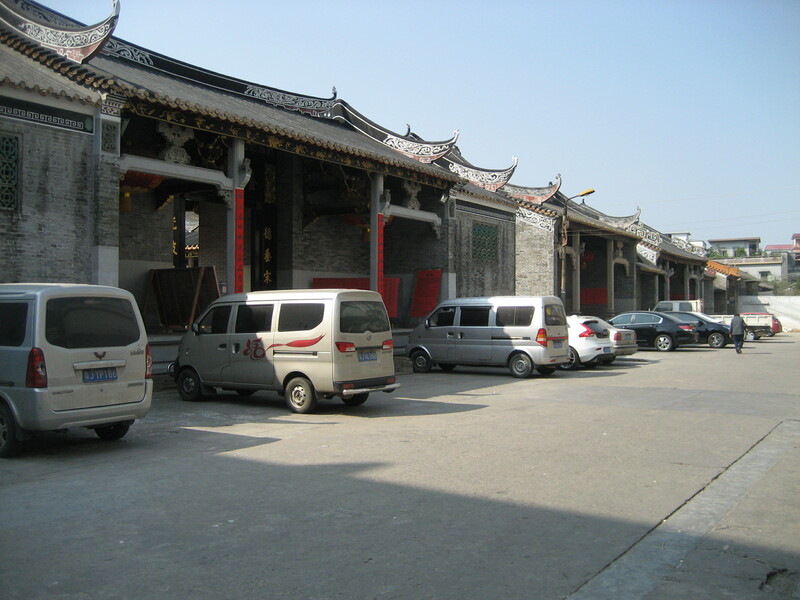 But there they were, all lined up one after another, sometimes interspersed with other buildings, or with buildings that didn’t necessarily look like ancestral halls. 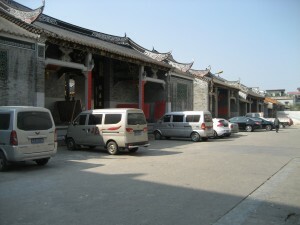 During the middle of the 20th century, many halls were used for other purposes, including as factories, and not all have been restored or had additions removed. The street level has also been raised, and the lowest of the steps up to many of the halls have been swallowed up by concrete. 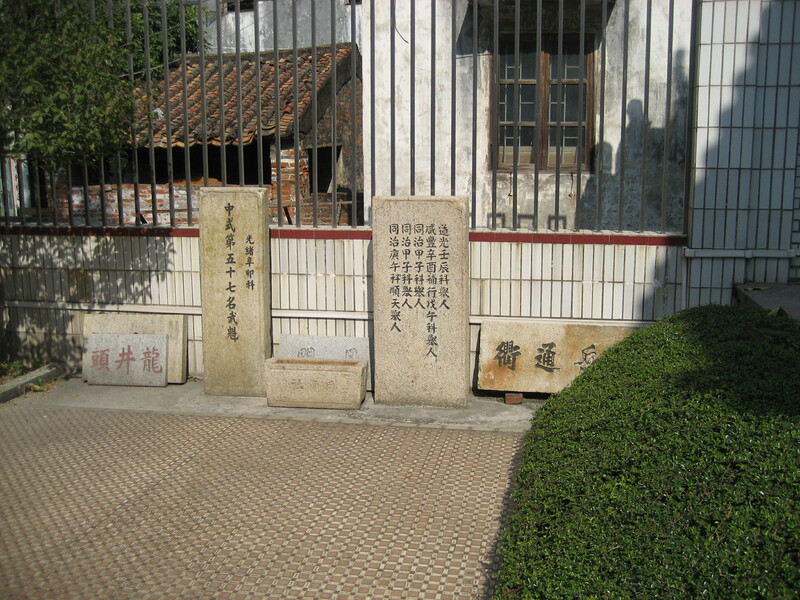 The Minghuan (‘distinguished official’) Ancestral Shrine (名宦家廟) has been heritage listed because of the importance of the person it was dedicated to — a high-ranking official who became teacher to the emperor. 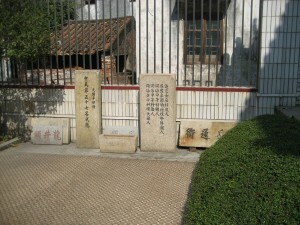 The shrine hasn’t been restored and here the destruction of the Cultural Revolution is very clear. 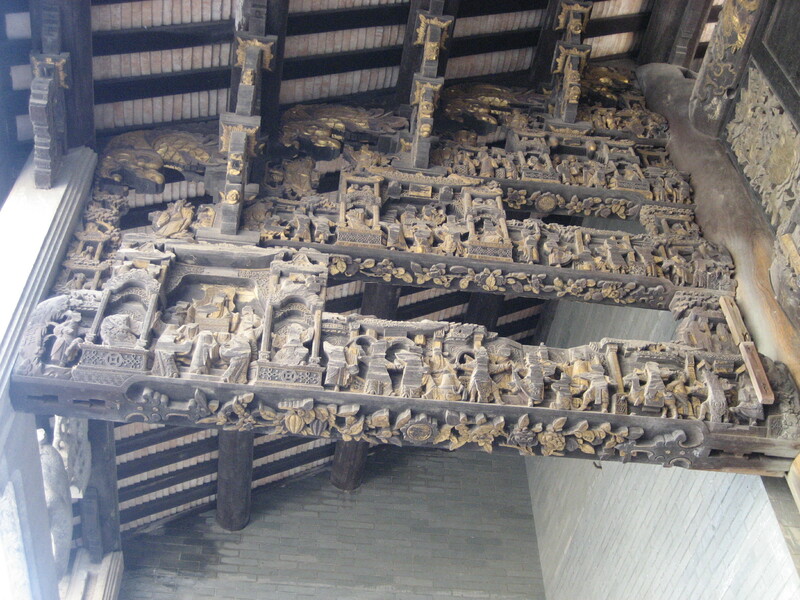 The plasterwork and frescoes have suffered a lot of damage or been removed, and all the heads of the carved timber figures above the entrance have been knocked off. Many of the ancestral halls were not open since we were there around lunchtime, but as we were walking back along Lu Bian Hai Tian Street they started to open their doors again. 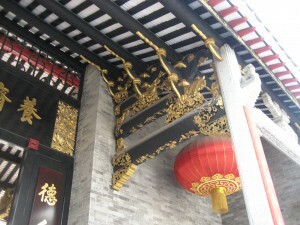 We went into the Yang Zhai Lu Ancestral Temple (養齋盧公祠) to have a look. 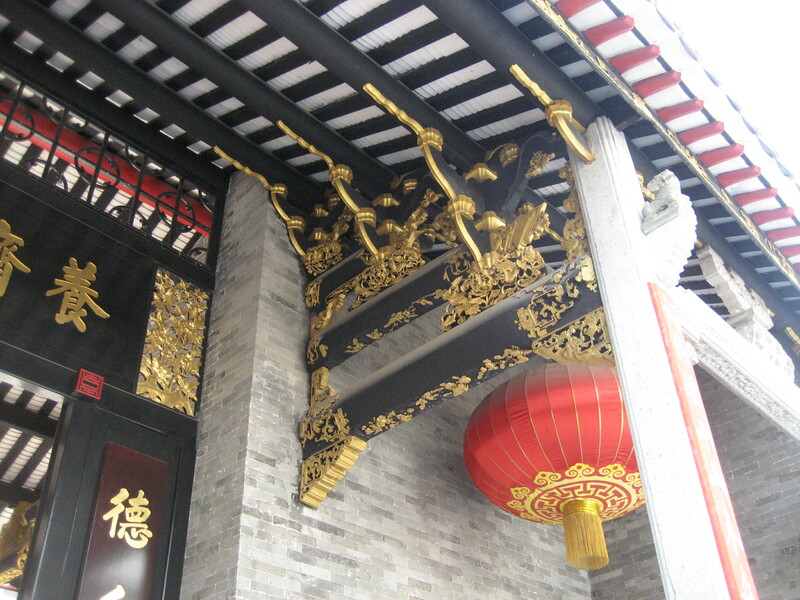 As we walked through the gates Selia told me that this ancestral hall has a very lovely story attached to it. 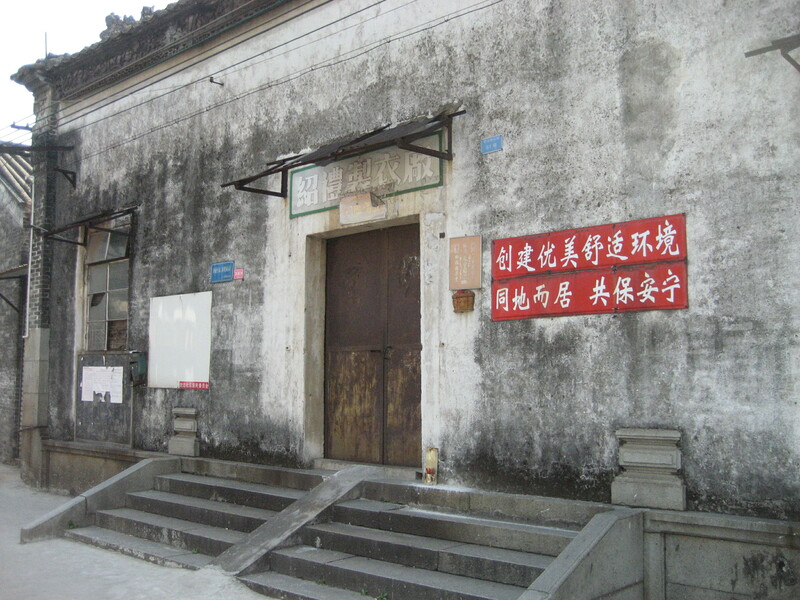 Like many of the other halls, this one had fallen into disrepair and in around 2012 the clan members decided to raise money to repair and restore the hall. 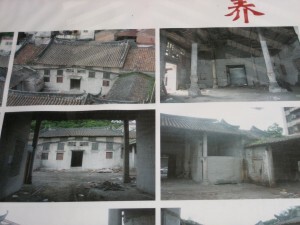 But as they weren’t as well off as some of the other villagers, all they could raise was the money to buy the materials for the renovation. Since they could not afford to hire tradesmen to undertake the work, people decided to volunteer their labour. Just inside the big front door is a display of photographs documenting the progress of their work. As we were looking around, one of the caretakers came back from lunch and we started chatting to him. He was clearly very proud of the work that they had done and, while the quality of the work and the fittings might not be as lovely as in some of the other ancestral halls we saw in Chaolian, Mr Lu’s enthusiasm for the restoration project and his obvious love of the place made it seem all the more beautiful. And as a bonus, he showed us the two dragons tucked away in a storeroom!